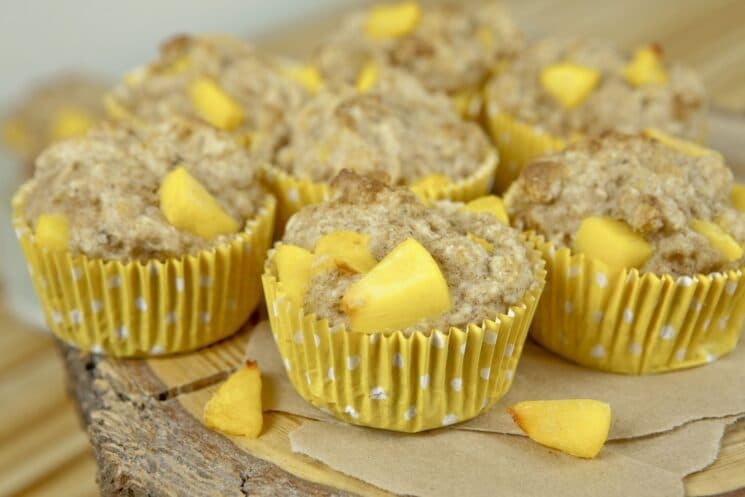 This Cinnamon Peach Muffin recipe can be made for a healthy breakfast, any day of the week. Hands down, our muffin recipes are the most popular category on our website! And it makes sense too. It’s simple to include a variety of fruit, or even veggies to a muffin recipe. Kids can learn to taste new flavors, while eating foods they are familiar with. 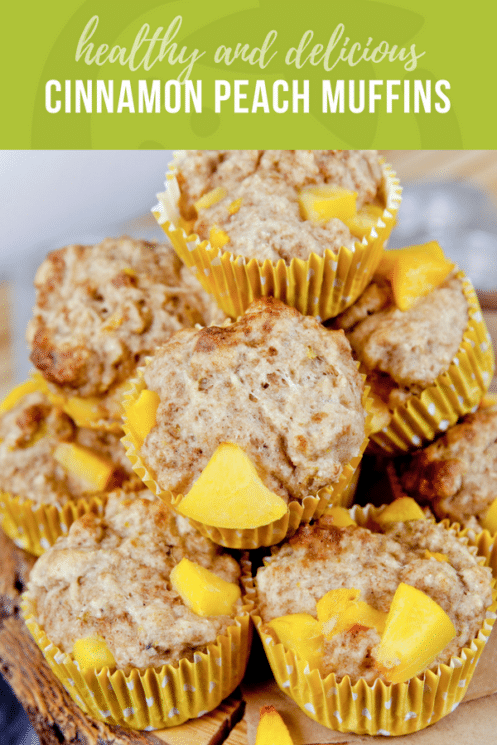 This is a great reason to try a variety of muffins to introduce new foods to picky eaters! 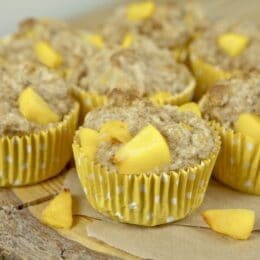 So, why PEACH MUFFINS? Peaches are an excellent source of vitamin C and potassium. But that’s not all. Peaches contain a phytochemical called Polyphenols. The polyphenols are contained in plants to fight and protect from insects and disease. In our body, the polyphenol acts the same way. They can kill or neutralize bad cell, helping us to be healthier, fight disease, and even protect from many cancers. Peaches are also a great source of fiber. In fact, fiber is the biggest reason we eat so much fruit in our house, despite the argument we get from many parents that fruit is high in sugar. The fiber in fruit helps kids digestion, and is very important to keep in their diet. Kids should have 15 grams of fiber, plus their age per day. So a 5 year old should have 20 grams. Peaches supply about 2.5 grams. Peaches are also a great source of beta carotene, a pre-curser for vitamin A. This supports and enhances eye health and eye diseases. 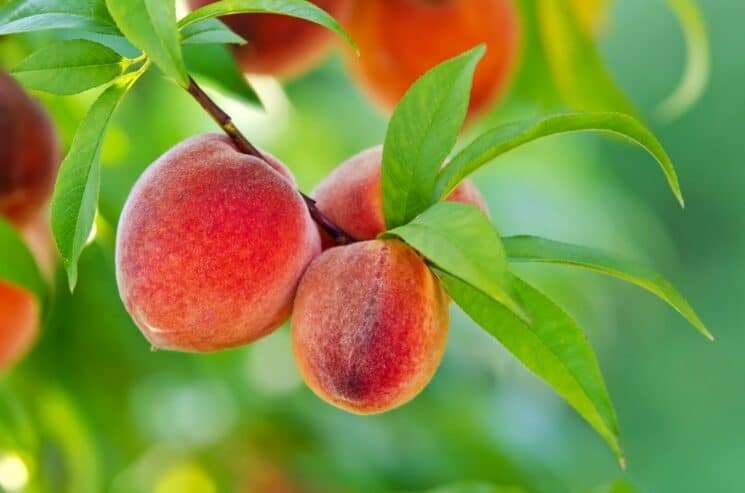 There are two common varieties of peaches, freestone and clingstone. While they are both nutritionally similar, they each have a different purpose. Remembering how they are different is easy. The freestone variety of peaches contains a pit that pops easily out of the flesh. You know you have the clingstone peach because the pit and the flesh NEVER separate! In fact, the only way to get the most flesh off of the pit, is to use a sharp knife and cut around the pit. And even then, you’re left with flesh that is still clinging onto the pit for dear life. In my own kitchen, we prefer the freestone for canning, because canning the clingstone is a huge mess! But commercially canned peaches, clingstone is more common because they are juicier! White peaches- these are actually sweeter than yellow peaches. Commonly found in Asia, but becoming more popular around the world. 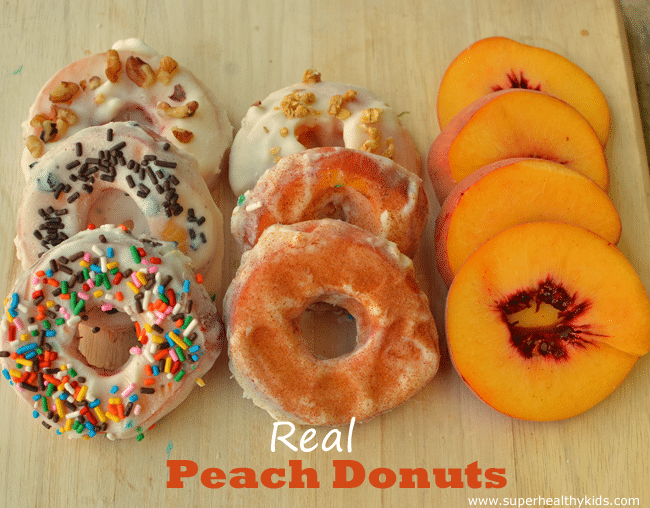 Doughnut peaches or Saturn peaches- these look like donuts because they are flat and round. They also contain the white flesh. Dwarf Peaches- these peaches are grown on a dwarf tree, intended to take up less space and produce quickly. For this recipe, we used half whole wheat flour and half white flour, but you can also use 100% wheat flour. Experiement a little to decide the level of heartiness your family likes in a muffin. 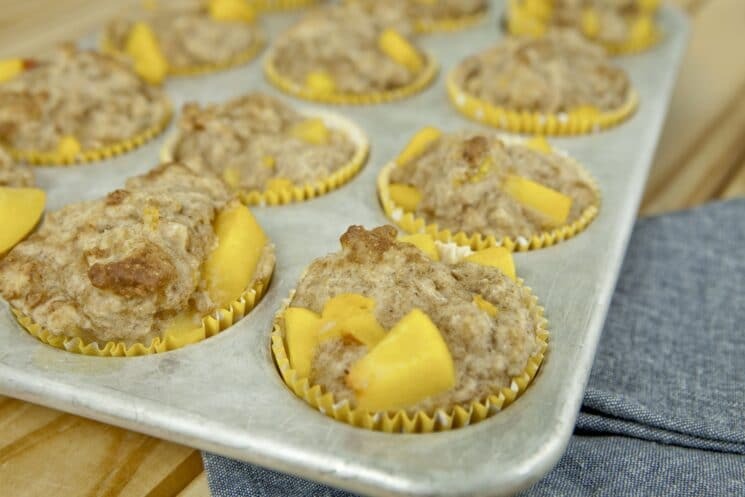 Whole wheat flour muffins will be a little denser, but you can minimize this a bit by using whole wheat pastry flour for lighter muffins, or whole wheat white flour, ground from white wheat rather than red wheat. Save, store and organize your recipes in our new free app, PREPEAR! Save this recipe in your Prepear account today! This was one of my favorite first blog posts I wrote… you’ve got to check it out! Preheat oven to 350°F. Place paper liners into muffin tin. Set frozen peaches out to thaw. Mix together sugar, applesauce, yogurt, egg, and vanilla until creamy. Add flours, baking soda, cinnamon, and salt to the sugar mixture and stir until combined. Chop thawed peaches into bite-sized pieces and fold into batter. Distribute batter evenly among paper liners. Sprinkle with coarse sugar, if desired. I usually make a dish rather than muffins since I have a flat freezer. The flavor is very non sweet and I think the sprinkle of sugar on top would be scone-like. The bites with the peaches were quite good so maybe I might try to better spread them next time. Could be a good snack with a bit more care on my side! I added bananas and made it with less coconut sugar. What can I substitute the Greek yogurt with? More applesauce?